Summon: Summon a Power Sphere in each lane. Dwarven Colossus is an epic Neutral creature card. It is part of the Clockwork City story set. A playset of the card is awarded for completing The Inner Curiosity. The premium version can only be obtained by soul-summoning, which is only possible after the completion of The Inner Curiosity. The Power Sphere's trigger applies the Powered Up card effect. Dwarven Colossus will only get keywords from its own summoned Power Spheres. This still applies after the Power Sphere has been unsummoned and played again. Dwarven Colossus first appeared in The Elder Scrolls Online. There is evidence that this card specifically depicts the Assembly General, who first appeared in ESO. 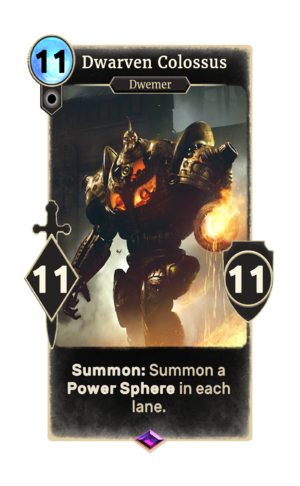 The Power Spheres he summons are a reference to one of the mechanics he has with the Dwemer Sentries known as Terminals, Furthermore, His background showcases the final boss fight area within the assembly lines of the Halls of Fabrication. This page was last modified on 13 April 2019, at 21:50.